If your concerned, as we are, about the introduction of Rocky Mountain goats (bovine family) into an already compromised ecosystem in the La Sal Mountains, the following are the agency people you can contact and submit public comments to. After this list are two letters from the Grand Canyon Trust, which will serve as talking points for your letters. The director of the DWR reports directly to the executive director of Natural Resources. The Utah Wildlife Board is appointed by the Governor and serves as the board of directors for the DWR. After receiving input from the DWR and the public through a series of statewide regional public meetings of the Resource Advisory Commissions (RAC meetings), the Wildlife Board sets general wildlife policies for the state. The DWR is headquartered in Salt Lake City, Utah, but is divided into five geographic regions, with offices in each, that cover the entire state. Most on-the-ground work is handled in the regions and coordinated from the administrative offices in Salt Lake City. The Forest Service is responsible for maintaining habitat in the La Sal Mountains, including for the Forest Service sensitive species La Sal Daisy (Erigeron mancus), the Forest Service sensitive species La Sal pika (Ochotona princeps subsp. lasalensis) and the native condition of the Mt. Peale Research Natural Area. On May 5, 2013, the Grand Canyon Trust wrote to the Southeastern RAC and the Wildlife Board, opposing the plan to introduce Rocky Mountain goats to the La Sal Mountains. We reiterate our belief that the introduction of Rocky Mountain goats to the La Sal Mountains by UDWR is irresponsible, because UDWR has committed neither to (1) monitoring damage these exotic goats may do to the diversity and abundance of uncommon subalpine plant species and dependent wildlife in the small, fragile subalpine areas of the La Sal Mountains; nor (2) responding to any stated limits of species decline the goats might be found to be causing. 1. Rocky Mountain goats are exotic to the La Sal Mountains. 2. Climate change, with thinner snow cover, earlier snowmelt, higher temperatures, and drought, is stressing subalpine/alpine communities throughout the world and in the West. 3. The La Sal Range is small and is already subject to excessive browsing and grazing by other ungulates as well as an extensive road system, motorized recreation, mountain bike recreation, dispersed and developed campsites, private inholdings, multiple types of forms of hunting, fishing, trapping, climbing, and hiking. 4. Upper elevations of the La Sal Mountains are the only areas not heavily grazed in the La Sal Mountains . 5. Rocky Mt goats lack functionally effective predators in SE Utah. 6. Neither the UDWR nor the U.S. Forest Service have demonstrated any track record, intention, capacity or will to track declines in the suite of remote, obscure, subalpine native grass, forb, moss, and lichen subalpine species, all of which Rocky Mt elk consume. 7. Hunting tag pressure will favor Rocky Mt goat population increases. 8. The Forest Service would be limited in capability vis-à-vis UDWR to protect habitat impacted by Rocky Mt. goats even if they do detect declines in subalpine species diversity. In 2012 La Sal Mountains snowpack and drought were such that those who use irrigation water from Ken’s Lake were cut back in their use by 40%; this year they are being cut back 60% by continuing drought. 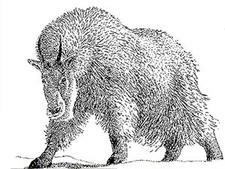 It is brutal to introduce exotic ungulates into a stressed, fragile mountain habitat when all climate models point to deepening drought and stresses in coming years in southern Utah. 4. responding to any limits of damage by removing Rocky Mountain goats. Unless UDWR is able to clearly state the limits of damage to La Sal Mountain subalpine communities they will accept by Rocky Mountain goats, and commit to monitoring as to whether those limits are broken, the plan to introduce Rocky Mountain goats is simply destructive. The Grand Canyon Trust opposes the proposal to introduce Rocky Mountain goats to the La Sal Mountains. Rocky Mountain goats are exotic ungulates which, as UDWR notes, typically live in the highest, subalpine and alpine elevations in a mountain range and eat lichens, mosses, grasses and herbs. 1. Rocky Mountain goats are exotic to the La Sal Mountains. Rocky Mountain “goats,” in the bovid family with cattle, are exotic ungulates to the La Sal Mountains. Have we not learned to avoid introductions of exotic species for some narrow personal interest (in this case viewing and hunting an exotic ungulate)? 2. Climate change is stressing subalpine/alpine communities. Field scientists are ringing alarm bells based on their measurements of impacts on subalpine and high elevation plant and wildlife communities (including butterflies and other pollinators) associated with climate changes (e.g., earlier snowmelt, increased drought, higher temperatures). They note the scant or non-existent ability of these high elevation species to migrate to refugia, because these plant communities and wildlife species are already at the top of their mountain ranges. It is the height of irresponsibility to add the stress of grazing and browsing by exotic ungulates to climate change stresses on these high-elevation plant and wildlife communities in the La Sal Mountain range in southeastern Utah. 3. The La Sal Range is small and is already subject to excessive browsing and grazing by other ungulates (cattle, elk, and deer); as well as an extensive road system, off-road motorized recreation, dispersed camping, developed campsites, mountain bike recreation, private inholdings, hound and other forms of hunting, fishing, trapping, climbing, and hiking. 4. Upper elevations of the La Sal Mountains are among the only areas not hevily grazed. The upper portions of the La Sal Mountains, for example the Gold Knob area, are among the only locations in the La Sal Mountains that are not heavily grazed, browsed, and trampled by elk, deer, and/or cattle. These are among the only locations that are not heavily crisscrossed by roads and trails. This is precisely the area in which mountain goats would be grazing and browsing on the diverse, native grasses, forbs, mosses, and lichens. 5. Rocky Mt goats lack predators in SE Utah. Like elk, Rocky Mountain goats are largely free of predators in southeastern Utah, with the exception of potentially some cougar predation. UDWR is only beginning to acknowledge browsing impacts of excessive elk populations on aspen communities throughout southern Utah. UDWR has yet to demonstrate a willingness to limit elk to levels that will reduce or eliminate excessive browsing of aspen sprouts which is resulting in an easily visible and measurable region-wide deficit in recruitment of aspen. Excessive grazing of native forbs, mosses, grasses, and lichens by Rocky Mountain goats will be even harder to track than the easily-seen declines and losses in aspen recruitment. 6. The UDWR and USFS lack capacity to track declines in high elevation plant/animal species. Neither the UDWR nor the U.S. Forest Service have demonstrated either the capacity or will to track declines in obscure native grass, forb, moss, and lichen species anywhere, and yet these are precisely the species that Rocky Mountain goats would be consuming. Pollinators of the native grasses and forbs have never been tracked by the Forest Service. 7. Hunting tag pressure will favor Rocky Mt goat population increases. The pressure to sell hunting tags for Rocky Mountain goats and to make viewing of these exotic ungulates easy for visitors will mean that meaningful control of the Rocky Mountain goat population will be approached reluctantly if at all by UDWR. 8. Forest Service is limited in capability to protect habitat Impacted by Rocky Mt. goats. The U.S. Forest Service is charged with responsibility for wildlife habitat while UDWR is charged with responsibility for wildlife populations (particularly huntable wildlife such as elk, deer, and mountain goats). This has set up an historically and currently tense, or even unworkable relationship, whereby any concerns the Moab-Monticello District might express re: excessive grazing and browsing by Rocky Mountain goats would be reduced to a request at the Southeast Region Advisory Council or Wildlife Board to reduce Rocky Mountain goat populations. Such requests can be and often are ignored by UDWR. 9. The Forest Service lacks capacity and will to track obscure, remote species. The Forest Service has demonstrated scant attention to excessive ungulate grazing and browsing of sagebrush community native forbs and grasses, wet meadows, native riparian graminoids and forbs, and aspen community native grasses, forbs, and shrubs. The Forest Service is even more unlikely to monitor, observe, or halt declines in obscure native grass, sedge, forb (wildflower), pollinator, lichen, and moss species that are limited to remote upper areas of the mountains which are hard to access – except by Rocky Mountain goats. The proposal to introduce for hunting or viewing pleasure a large, exotic ungulate to the already-stressed La Sal Mountains does not demonstrate any sensitivity to perhaps the most fragile communities of all in these mountains, and the precise communities most immediately threatened by climate change. Grand Canyon Trust urges the withdrawal of the idea of introducing Rocky Mountain goats to the La Sal Mountains.